With last week's impromptu sunshine (and tan lines) fading to a mere memory, I've spent the early part of this week longing for the return of those beautiful spring evenings. 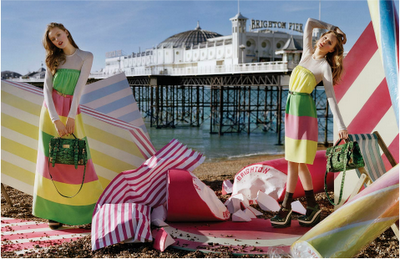 Mulberry's latest ad campaign offers endless inspiration for Spring/Summer 2012... Candy stripes are showcased in canary yellow, mint green and flamingo pink, and given a grown up feel with muted sheer ankle socks, Mary-jane wedges and trademark leather goods. Maxi skirts and tailored shorts come in pleated chiffon, leather and luxe jersey, while outerwear comes in the form of hooded trenches, patent kagools and collared biker jackets; a key look for the season. My favourite of the season!